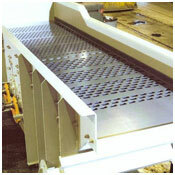 Carrier Delta-Phase® shakeout machines efficiently shake out castings and reduce sand lump size. 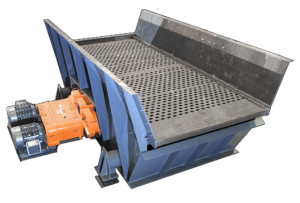 Our Delta-Phase shakeouts (patent #5,615,763) use a unique vibratory motion to separate sand from castings, allowing sand to pass through a perforated deck and castings to end discharge for further processing. These shakeout machines allow for precise control over the angle of vibration, optimizing the removal of sand, even when the machine is in-use. The heart of the Delta-Phase Shakeout is the process controller. Using simple and reliable electronics, the Delta-Phase shakeout machine is able to precisely control the angle of vibration. This change in vibration angle controls the conveying speed and retention time of your castings on the shakeout deck, optimizing sand removal. You can accurately and automatically change this angle – even on the fly! 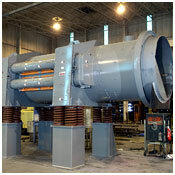 For more information on Carrier shakeout machines, refer to brochures #16616 and #16617.